New & improved. CC+ Colorseal conditioner. 3 salon tones, 1 simple step. Superior natural looking color. 100% gray coverage. Same great shade! 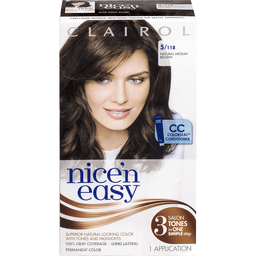 Similar to salon formulas, Nice 'n Easy blends 3 tones into every shade. 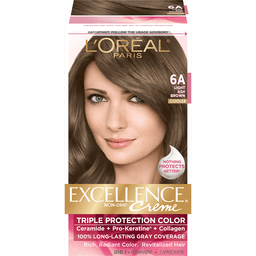 The secret to our long lasting natural looking color is Clairol's Colorblend Technology. On gray hair, color appears lighter than non-gray for a highlighted effect. 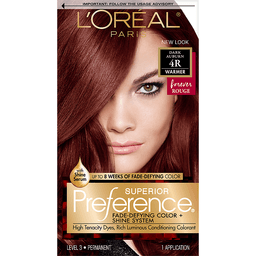 On natural red hair, color gives a medium golden brown result with red tones. Tones & highlights. Shiny, Conditioned Hair: Our multi-tasking CC+ Colorseal conditioner adds intense shine, helps lock in natural looking color and protect hair between coloring. 100% gray coverage and color that lasts up to 8 weeks. Extend your color. 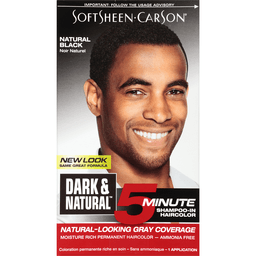 Keep your color beautiful between colorings with root touch-up shade 5. What's Inside: Colorblend formula, Colorblend Activator, CC+ ColorSeal conditioner, Expert gloves. For help, call 1-800-Clairol or visit www.clairol.com. Ingredients are listed on the bottom of the box. Made in Mexico. New look. With fruit oil ampoule. Enchanting blacks. Triple Oils: avocado, olive & shea. Rich, long-lasting color. 100% gray coverage. Silky, shiny, nourished hair. Important: Follow the usage advisory. Nourished hair means better color. Nourished Hair: Nutrisse is the only nourishing color creme with a grapeseed fruit oil ampoule you can snap & pour directly into you mix. Lock in moisture for soft, silky and nourished hair with our creamy after color conditioner infused with avocado, olive and shea oils. Triple oils. Fruit oil ampoule. Better Color: Nutrisse gives you rich, long-lasting enchanting blacks with 100% gray coverage. 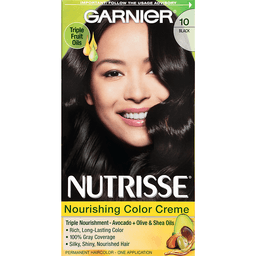 Boosted by pure pigments, Nutrisse gives you shiny and accurate color from root to tip. And our non-drip color creme spreads evenly and smells great. Non-drip formula. What's Inside: Creme developer, Nourishing color creme, Fruit oil ampoule, Nourishing conditioner. Rich long-lasting color luscious browns. Find your haircolor result. Results will vary depending on condition and color of hair. Find your perfect shade: visit Garnierusa.com/shadeselector. Garnier Cares: This paper has been certified to meet the environmental and social standards of the Forest Stewardship Council. We have teamed up with TerraCycle to help keep beauty products out of landfills! Join a beauty brigade and help us create a cleaner, greener future. Sign up at garnierusa.com/green. TerraCycle. This Garnier carton is recyclable. Take care. Please recycle. FSC: Mix - Packaging from responsible sources. www.fsc.org. Questions? 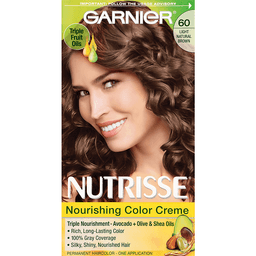 Garnier Nutrisse has expert color consultants to help you. Call: 1-800-4Garnier (1-800-442-7643) or visit www.garnierusa.com. Made in Mexico. This Kit contains: Color optimizing creme, color gel, care supreme multi-dose conditioner (6 weekly treatments), superior colorist gloves, pro-precise applicator, insert. Permanent. With shine serum. Up to 8 weeks of fade-defying color. Fade-defying color + shine system. Rich luminous conditioning colorant. Level 3. 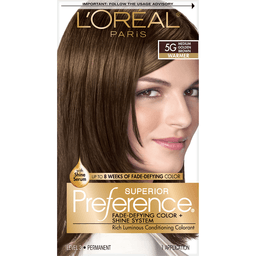 Experience Preference, our true gold standard of beautiful color and shine. Preference's Superior Fade-Defying Color and Shine System creates a rich long-lasting color spectrum with luminosity, shine and beautiful gray coverage. Luminous color shines from every strand and defies fade-out for up to 8 beautiful weeks. Plus our color protective Care Supreme Conditioner formulated with Golden Camelina oil, anti-oxidant vitamin E and UV filter helps keep first day color vibrancy and provides silky, resilient hair. 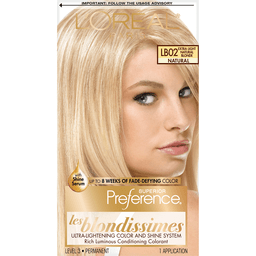 From root to tip, color won't fade-out, turn dull or brassy. Pro-precise applicator. Because you're worth it. Questions? Need shade advice? 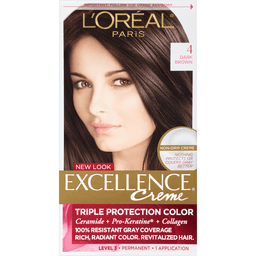 Contact the experts at L'Oreal Consumer Affairs 1-800-631-7358 or visit www.lorealparis.com. Made in Mexico.